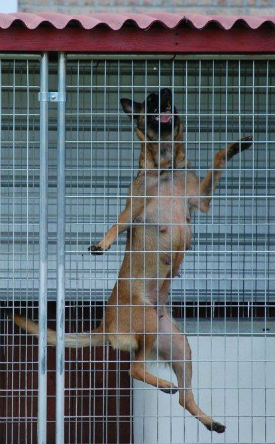 Flora is a young medium sized malinois that is very solid and well built. She has a rich mahogany coloring with black mask. In terms of drive, she is complete in every aspect of the work. Her bite/patrol work, hunt drive, possession and desire to work are over the top. Her prey drive is very intense and extreme. She comes from top producers (new and old) to include Arno, Duco II, Arras Derks, Chico Willems, Rico 1 and Rudy Jensen. She is a daughter or Cooper Huijs PH I who is a well known Security (SWAT) dog in Holland today as well as producing very well. She has some of the most stable and complete nerve of any female I have seen. 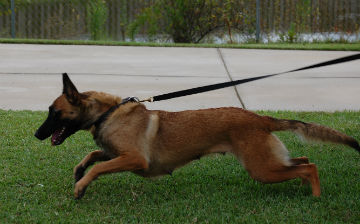 She is not your typical sport dog, she is of Law Enforcement / Military quality in her level of sharpness and civil edge. She is easily manageable out of drive, however when the work begins, she is very intense and an experienced handler is a necessity. Flora has produced extremely well for our breeding program and now that we have offspring from her we are making her available to the right working home.